An average of 30 people have been killed in Yemen every single day since the beginning of the war on March 26, which pits a US-backed coalition of Middle Eastern nations and forces loyal to President Abd Rabbuh Mansur Hadi against Iran-backed Houthi rebels and fighters loyal to former President Ali Abdullah Saleh. UNICEF estimates nearly 400 children have been killed and over 600 injured in the past four months in the country, the poorest in the Middle East. 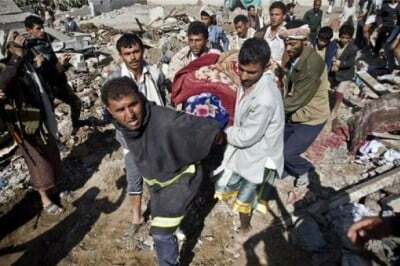 A Red Cross spokeswoman said the violence in Ta’iz, in southern Yemen, in just one day on August 21 left 80 people dead. Meanwhile, al-Qaeda continues to grow and take more territory as the US-backed, Saudi-led bombing destroys infrastructure and plunges millions of Yemenis, most of whom already lived in abject poverty before the war began, into further desperation. The Houthis and al-Qaeda are sworn enemies. Al-Qaeda seeks to capitalize on the chaos in which the country is embroiled. In the midst of the bedlam, however, ISIS has also attempted to extend its influence influence in the region. Further adding to the messy entanglement of alliances, ISIS has fought not just the Houthis and the Saudi-led coalition, but also al-Qaeda. Almost half a year into the conflict, violence appears to be escalating, not diminishing. In July, I reported that, according to UN figures, 3,000 people had been killed in Yemen in the first 100 days of Saudi-led bombing, half of whom were civilians. Just 20 days later, that figure had risen to at least 3,600 dead, with over 17,300 wounded. July 24 was the bloodiest day of the conflict yet. On that day alone, coalition air strikes killed over 120 civilians and wounded 150 more in Ta’iz. Leading human rights organizations maintain the US and other Western allies of Saudi Arabia can be held accountable for war crimes being committed by the coalition. In an interview with Rolling Stone, a Yemeni man insisted that the US was complicit in the coalition’s killing of children. Yemen is the poorest country in the Middle East. Before the war broke out, over half of the population lived on less than $2 USD a day and had no access to clean water, according to the World Food Program. 41% of the population was food-insecure, and child malnutrition rates were among the highest in the world. Unemployment rates exceeded 40%, over 60% among the youth. In the meantime, extremist groups, namely al-Qaeda, have flourished in these dire conditions. The coalition, led by Saudi Arabia, consists of monarchies Bahrain, United Arab Emirates, Qatar, Kuwait, Jordan, and Morocco, along with Egypt and Sudan. The US and other Western nations have provided Saudi Arabia with weapons, in spite of knowledge that the arms are being used to commit what human rights organizations and the UN have classified as potential war crimes. Human Rights Watch (HRW) has said the Saudi-led coalition has engaged in unlawful targeting of civilian areas. Coalition air strikes have rained down on hospitals, schools, neighborhoods, and more. Amnesty International has accused the coalition of knowingly violating international humanitarian law in its bombing campaign. And there “is no indication that the Saudi Arabia-led military coalition has done anything to prevent and redress such violations,” remarked Amnesty’s Senior Crisis Response Advisor Donatella Rovera. Just a few days into its assault, the Saudi-led coalition bombed a refugee camp, killing roughly 40 people, injuring around 200 more. Weeks later, the coalition purposefully destroyed an Oxfam humanitarian aid warehouse, in what HRW classified as “an apparent violation of the laws of war.” Oxfam “vehemently condemned” the attack. In its attacks, the coalition has also used banned cluster munitions, weapons that are prohibited by a 2008 treaty that was adopted by 116 countries (Saudi Arabia and the US refused to sign the accord). The US is complicit in these potential war crimes, HRW maintains. The UN and human rights organizations have called on Western nations to cease their support for the military assault, which has pushed Yemen to the edge of catastrophe.